Ener-C was designed with you in mind. We have produced a delightful-tasting, effervescent vitamin drink mix that comes in a variety of natural fruit flavours for you to enjoy. Please click here (supp facts) to have a look at all of the natural goodness we have put into Ener-C. All vitamin and mineral sources have been chosen not only for their quality, but also for their ability to absorb easily in the body, ensuring that you get the greatest benefit from each and every packet of Ener-C.
Energy: We know you need that boost of energy during the day. Why bother with caffeine and sugars that only give you a short burst followed by a quick crash? 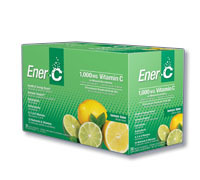 Ener-C will help to increase and maintain your energy levels, due to the invigorating force of the B-vitamin complexes and electrolytes it contains. Get the real energy your body needs from Ener-C.
Health: We want you to stay healthy year-round, especially during cold and flu season. Is Ener-C that miracle cold and flu fighter you have been searching for? We’ll let you be the judge of that. Just make sure you keep your levels of Vitamin C and zinc up, and let us know how you faired when everyone else was down and out with the cold and flu. Maintain and boost your immune system with Ener-C.
Electrolytes: Sure, we want you to perform at your sporting best. But you can’t do that without your electrolytes. What is the best way to get those electrolytes? Some say Ener-C. Whether it’s after or before a workout or game, or that extra sweaty time with a good friend, try it and see for yourself. Pssst - Did you drink a little too much last night? Have a little bit of a sore head, do you? Ener-C will turn that cloudy day after, into a sunny day full of possibilities. Taste: We know that each one of you is unique and have different things that turn you on and off. One thing we do know is that most, if not all, of you like the taste of fruit. That’s why we have launched Ener-C with four unique and deliciously effervescent, all-natural fruit flavours. So make sure you try our Orange, Raspberry, Lemon-Lime, and Tangerine-Grapefruit flavours and know that each time you drink a tasty Ener-C, you’re getting the benefits of consuming real fruits along with your vitamins and minerals. Ener-C is full of 25 nutrients and vitamins to make you feel and perform your very best. 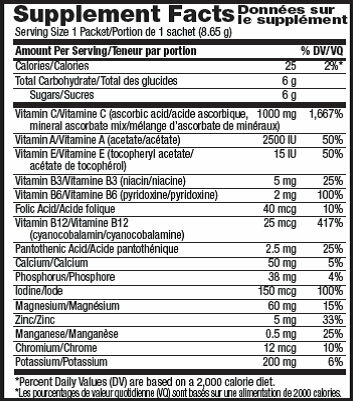 Have a look at our Supplement Facts table below to see what’s in our wonderful packs of Ener-C.
Lemon-Lime: Fructose, Citric Acid, Natural Lemon-Lime Flavor, Sodium Bicarbonate, Lemon Pulp Powder, Tapioca Maltodextrin, Malic Acid, Tartric Acid, Quercitin Dihydrate Powder, Silicon Dioxide, Natural Lime Flavor, Glycine, Cysteine HCl. For adult use only.As a dietary supplement take one packet up to two (2) times a day, with food. Take a few hours before or after taking other medications. Consult a health practitioner prior to use if you are pregnant or breastfeeding.